with 15-24 year olds accounting for half of all new STD infections. Anyone who is sexually active can get an STD, but some groups are more affected. IF YOU TEST POSITIVE: GETTING AN STD IS NOT THE END! is important to avoid getting re-infected. Each March National Nutrition Month is celebrated to focus attention on the importance of making informed food choices and developing sound habits. Small changes to your daily eating or drinking habits can make a positive difference to your health. The Chenango County Health Department 2019 health campaign encourages you to RETHINK YOUR DRINK CHENANGO: DRINK WATER. Drinking water is important for overall health and well-being. It is a simple change that anyone can make in their daily lives that can greatly change overall health for the better. Drinking water is a healthy alternative to sugary drinks such as soda, fruit drinks, energy drinks or sports drinks. Many of these types of drinks contain more sugar than people often realize, giving them unwanted extra calories and causing tooth decay. Popular soda brands contain approximately 15-18 teaspoons of sugar in one 20 ounce bottle and 275 calories. Some sports drinks, iced teas and flavored waters that people often view as healthier alternatives to soda contain 8-12 teaspoons of sugar in one 20 ounce bottle and 160 calories. It is very important to read labels when choosing these drinks. year olds and 8 ounces of juice per day for 7 years old through adulthood. to 1-2 years of age. 6. Add fruit to water to make it more appealing such as lemon, cucumber, berries, or mint. 7. Only use 100% fresh or reconstituted fruit juice when given. 8. Order water when you eat out or when you have fast food. It is often given for free. The purpose of the National Nutrition Month Campaign is to increase the public’s awareness of the importance of good nutrition. You can start by choosing more water. Your body depends on water to survive, making up 60 percent of your body weight. It helps to get rid of waste, regulate temperature, lubricate joints, make healthy skin, and protects sensitive tissues. Every cell, tissue and organ in your body needs water to work properly. We encourage you to make a small change for your health and RETHINK YOUR DRINK: DRINK WATER CHENANGO. 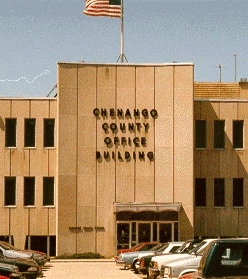 Chenango County Health Department would like to increase awareness and education of heart disease in the community. February is American Heart Month. This is a great time to learn more about heart disease and what you can do to reduce your risk of developing heart disease. According to the CDC: heart disease is the most deadly disease in America and heart disease is responsible for 1 in 4 deaths in the U.S. Certain heart disease risk factors that cannot be changed include but are not limited to age, gender, family history and ethnicity. However, risk factors that can be changed include maintaining a healthy weight, smoking cessation, reducing and monitoring blood pressure, increasing physical exercise, and reducing and monitoring blood cholesterol levels.  Normal blood pressure is less than 120/80.  At Risk (Prehypertension) is 120-139/80-89.  High blood pressure is greater than 140-90.  Chest pain or discomfort that doesn’t go away after a few minutes.  Pain or discomfort in the jaw, neck or back.  Pain or discomfort in the arms or shoulder. If you think you are experiencing any of these signs call 9-1-1 immediately. Another factor that can reduce risk for cardiac disease is increasing physical activity and reducing obesity. According to American Heart Association, exercising thirty minutes a day five days a week improves heart health and reduces risk of heart disease. Exercise and physical activity directly improve heart health particularly aerobic exercise such as walking, swimming, jogging and riding a bike. The heart muscle needs exercise just like other muscles. Exercise stimulates production of new blood vessels also making vessels more flexible. As more blood vessels are made there are more places for blood to flow resulting in more efficient blood circulation. By improving circulation the heart can pump more blood throughout the body and work at optimal efficiency. With optimal blood flow, normal blood pressure can be obtained decreasing the risk of developing heart disease. Consult with your health care provider before beginning any exercise program. Your health care provider may be able to adjust your exercise routine to your specific needs. It’s Not Too Late! It’s that time of year again. As family and friends are planning for the holidays, flu activity is increasing. A flu vaccine can protect you and your loved ones and now is a great time to get a flu vaccine if you have not gotten vaccinated yet. The Centers for Disease Control and Prevention (CDC) estimates indicate that more than 900,000 people were hospitalized and more than 80,000 people died from flu last season. These new estimates are record-breaking, and emphasize the seriousness and severity of flu illness and serve as a strong reminder of the importance of flu vaccination. CDC recommends an annual flu vaccine for everyone age six months and older. Flu vaccination has been shown to reduce the risk of flu illness, and a growing body of evidence supports the fact that vaccination also reduces the risk of serious flu outcomes that can result in hospitalization and even death. CDC estimates that flu vaccines prevent tens of thousands of hospitalizations each year. A CDC study in 2017 was the first of its kind to show flu vaccination reduced the risk of flu-associated death by half (51 percent) among children with underlying high-risk medical conditions and by nearly two-thirds (65 percent) among healthy children. Most recently, an August 2018 study showed that flu vaccination lessened the risk of severe flu among adults, including reducing the risk of hospitalization and admission to the intensive care unit, and also lessened severity of illness. These benefits are especially important for people at high risk of serious flu complications, like people 65 and older, children younger than 5 years, pregnant women and people with certain underlying long-term medical conditions like heart and lung disease, or diabetes. While seasonal flu activity varies, flu usually peaks between December and February, though activity can last as late as May. As long as flu activity is ongoing, it’s not too late to get vaccinated, even in January or later. An annual flu vaccine is the best way to protect against this potentially serious disease. Even if you have already gotten sick with flu this season, it is still a good idea to get a flu vaccine. Talk to your health care provider, visit a local retail pharmacy, or call Chenango County Health Department (607-337-1660) to schedule an appointment for your flu vaccine today! The Great American Smokeout is an annual intervention that takes place on the third Thursday in November by the American Cancer Society. It is a time to join thousands of smokers across the country in taking an important step to lead a healthier life. We all know that quitting smoking is one of the most important things you can do in your life. We all know why it is bad for us. It can cause lung cancer, heart disease, stroke, emphysema, and chronic bronchitis. It increases our chances of developing cancers of the lip, mouth, throat, larynx, bladder, pancreas, stomach, kidney, a nd cervix. We also know that it’s expensive. Paying $10 for a pack of cigarettes per day is $3,650 per year. That is a lot of money for the average family to afford. So why don’t we quit? Nicotine in tobacco is very addictive, and quitting isn’t easy. It takes a plan. Start the conversation. How willing are you to think about quitting smoking or other form of tobacco? There is help for you if you are ready. Sometimes it takes several attempts to be successful. Don’t give up! It is never too late to try. Here is how to begin. * Talk to your doctor about the best ways for helping you quit including use of medications or nicotine replacements such as the patch or lozenge. * Call the New York State Smokers Quitline at 1-866-NY-QUITS (1-866-697-8487) for counseling and support from a trained Quit Coach. By phone or web, clients can request a variety of resources, including FREE nicotine replacement therapy (the nicotine patch) and fact sheets. Check out their updated website at www.nysmokefree.com.. Your Quit Coach can help you to pick a quit date that will work for you. * Get support from your family and friends. Let them know that you want to quit and may need their help and encouragement. Start the Conversation about the DAILY 4! BRUSH twice a day. FLOSS regularly. RINSE with mouthwash. CHEW sugar-free gum after meals. The American Dental Association and The Chenango County Department of Public Health would like to remind parents that attitudes and habits established at an early age are critical in maintaining good oral health throughout life. Taking of your child’s mouth, giving your child healthy foods and beverages, planning scheduled visits to the dentist, and taking care of your own teeth are important ways to start. The Chenango County Dental Taskforce has been working to bring attention to promoting good oral hygiene habits in schools. Thanks to the amazing support of community partners and dental clinics across our county, we were able to assemble and distribute dental hygiene kits to every elementary school child in Chenango County in 2017 and 2018. As a result, we supplied 3,867 students in 232 classrooms at 11 schools across Chenango County with their own toothbrush, toothpaste and floss each year. The goal is to continue to do this project and to pilot a program for brushing in the classroom. We hope that educating children in elementary and middle school about basic dental care will help improve their oral health as adults. -Wean your child from the bottle to a cup by the age of 12-14 months. -Brush br>your child’s gums each night even if they do not have teeth yet. Use a wet washcloth or a small soft bristle brush. -Do not put your child to sleep with a bottle. -Serve juice in a cup (only) and limit the amount to 4-6 ounces per day. -Help your child brush at least two times a day, after breakfast and before bed – making sure he/she spits out the toothpaste after brushing. -Give your child water several times a day- with fluoride if possible. -Reward your child with a smile and a hug, not with food. -Serve healthy foods to your child like fresh fruits and vegetables, whole grain products, dairy products, and lean meats such as chicken, eggs, beans, or fish each day. -Serve fewer sweets like candy, cookies, or cake in your household. Keep sugared drinks and sodas to a minimum or not at all. -If your child has not been to the dentist by age 1, make an appointment. -Ask your dentist about sealants and the appropriate time to get them. -Check your child’s teeth and gums at least once a month. -Do not allow smoking in your home or car. Secondhand smoke can cause dental problems. -Make taking care of your own teeth a priority. Children learn by example. Visit your dentist regularly and get your teeth cleaned twice per year. or call Chenango County Public Health at (607) 337-1660. Rabies: Protect Yourself and Family! 3. If your pet has an interaction with any animal suspected of having rabies DO NOT handle your pet. If you must attend to your pet after an interaction with an unknown animal wear gloves, long sleeves and use extreme caution. You can be exposed to rabies from lingering saliva on a pet’s fur. The pet should be isolated and the saliva allowed to dry, this will kill the virus. 4. If you or a loved one is bitten by an animal (wild or domestic), wash the exposed site immediately with soap and water & seek medical care. Be sure to report the bite to public health officials. 5. Wake up to find a BAT in your room? Bats have very fine teeth and we may not be able to visualize any bites or scratches on our bodies. In this case there is a possibility of exposure so you want to CAPTURE THE BAT to have it tested for rabies. The best thing to do is to call animal control or contact Chenango County Environmental Health at 607-337-1673. If help is unavailable the best way to capture a bat is by putting on leather gloves and clothing to cover your skin, allow the bat to land, approach it slowly, and place a box or coffee can over it, slide cardboard under the container to trap the bat inside. Tape the cardboard to the container securely, and punch small holes in the cardboard, allowing the bat to breathe. Contact your health department or animal control authority to make arrangements for rabies testing. Taking steps to protect yourself, loved ones, and pets from rabies is vital. Once a mammal shows symptoms of rabies it is too late, there is no cure and the mammal will die. So prevention is key! Alzheimer’s is a type of dementia that causes problems with memory, thinking and behavior. Symptoms usually develop slowly and get worse over time, becoming severe enough to interfere with daily tasks. It slowly diminishes memory and thinking skills, leading to an inability to carry out simple daily tasks and communication. Every 65 seconds someone develops this disease and it’s the sixth leading cause of death in the United States. Those with Alzheimer’s live an average of eight years after their symptoms become noticeable to others, but survival can range from four to 20 years, depending on age and other health conditions. Stages of Alzheimer’s include mild/early stage, moderate/middle stage and severe/late stage. In the early stage the disease may not be noticeable or you may notice some memory issues. During the moderate stage of Alzheimer’s, individuals may have greater difficulty performing tasks such as paying bills, but they may still remember significant details about their life. At late stage, individuals may require care around the clock with daily activities and personal care. In the severe stage the person may lose awareness of recent experiences as well as of their surroundings, ability to walk, sit, swallow, communicate and become vulnerable to infections. Unfortunately there is no cure for this disease, but if people receive early and accurate diagnosis it could help stall worsening and assist in providing care. So what can we do for persons with the disease and those who support them in providing the significant hours of care? First, we can get educated about this disease. Secondly, we can advocate by writing letters to our government officials on needs in the community of those affected by this disease. Lastly, we can support caregivers and those affected with the disease by encouraging usage of supports of The Alzheimer’s Association. They are a trusted resource for reliable information, referral and support to millions of people affected by the disease. To celebrate the importance of immunizations for people of all ages the Chenango County Department of Health is joining with partners nationwide in recognizing August as National Immunization Awareness Month. Throughout the month Public Health’s Facebook page will be addressing the immunization needs of back-to-school children, pregnant women, babies and young children, preteens/teens, adults, and vaccine safety. Vaccines are scientifically known to be the safest and most effective way to prevent serious diseases. All vaccines are thoroughly tested before licensing, and carefully monitored after they are licensed, to ensure they are safe. Back to school time is right around the corner making this the perfect time to be sure your child is up to date on their vaccinations. Vaccinating your children according to the recommended immunization schedule provides them with safe and effective protection against vaccine preventable disease. Many vaccine-preventable diseases can spread easily in child care and school settings. Protecting your children from preventable disease will keep them healthy and in school. Two vaccines are routinely recommended for pregnant women: a flu vaccine (can be given at any time during the pregnancy) and Tdap (given between 27 and 36 weeks gestation). Both vaccines are not only important in protecting mom’s health but that protection is also passed on to the baby. For babies and small children, a healthy start begins with on-time vaccinations. Vaccines give parents the power to protect their children from 14 serious diseases. It is easy to think of these as diseases of the past. Many people in the United States have never seen the devastating effects that diseases like measles or whooping cough can have on a family or community, but the truth is they still exist. Thankfully most parents choose the safe, proven protection of vaccines and vaccinate their children according to the recommended immunization schedule. Ensure your teen and preteen’s health future by keeping their vaccines up to date. As childhood vaccination protection wanes, adolescents need additional vaccines to extend protection. Adolescents need protection from other infections as well, before the risk of exposure increases. It is important to remember that vaccine preventable diseases still exist and outbreaks occur. Make sure your teen is protected. Vaccines are not just for kids! The need for vaccinations does not end in childhood, vaccines are recommended throughout our lives. Specific recommendations are based on age, lifestyle, occupation, travel destinations, and medical conditions. Vaccines are an important step in protecting adults against several serious and sometimes deadly diseases. Every year, thousands of adults in the U.S. become needlessly ill from infectious diseases that could be prevented by vaccines. Talk with your health care professional about which vaccine are right for you. Take the CDC’s vaccine quiz (www.cdc.gov/vaccines/adultquiz) to find out what vaccines may be recommended for you. When talking to your provider ask to have your vaccination record entered into the New York State Immunization Information System (NYSIIS). NYSIIS is a free immunization registry that stores your record in a confidential and secure manner. Your record can then be accessed by any other NY state licensed provider that you may see for care. In addition to having a record of all of your shots in one reliable place, it can ensure that you only get the vaccines you need and don’t end up paying for duplicate shots. 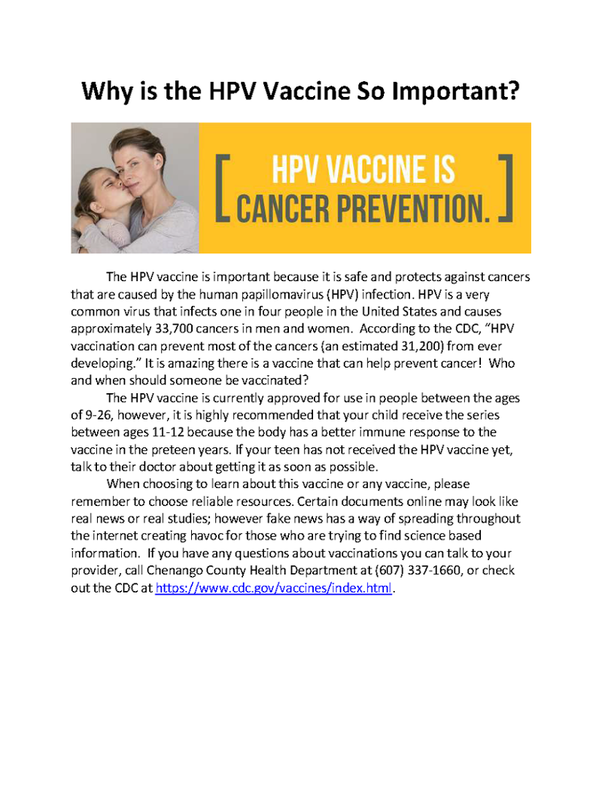 For more information on immunization recommendations or the benefits of using NYSIIS visit ImmuNYze (https://www.immunyze.org/), the Chenango County Health Department website (https://www.co.chenango.ny.us/public-health/nursing/immunization.php) or call the Chenango County Department of Health Nursing Division at (607) 337-1660. Hepatitis C is usually spread when blood from an infected person enters the body of someone who is not infected. Most people become infected through sharing of needles, syringes, and other equipment used to inject drugs. But could also be infected from sharing toiletries that may become contaminated with blood such as a toothbrush, razors or nail clippers. Many people do not have symptoms and the only way to find out is to get tested; especially if you are part of the population at risk. For more information about HCV in Chenango County please see the attached. For detailed information on Hepatitis visit https://www.cdc.gov/hepatitis/ or call Chenango County Public Health at (607) 337-1660.